What really happened to AIG and other bankrupt firms. It has come to light recently that American International Group withheld important information about its dealings with financial counterparties in the lead-up to its collapse and bailout by the Federal Reserve. What is most troubling about this episode is that it was officials at the Federal Reserve Bank of New York–not AIG–who seem to have orchestrated the secretive and potentially illegal activities. Moreover, the actions by the regulator were uncovered only through an investigation conducted on behalf of the House Oversight and Government Reform Committee. Were it not for the doggedness of the committee’s ranking Republican member, Darrell Issa of California, the public would be none the wiser. Is this what it has come to in America: Public officials making policy via cover-ups, secret deals and government coercion? It seems so. If we don’t demand a full investigation into this type of behavior and criminal prosecution where appropriate, we should expect more of the same in the future. The market has been looking pretty good over the past few months. Do not get too excited. The market becomes very volitile in recession/depression times. Jobs have not recovered. The above chart shows the dow from 2007 (the peak) and now. Its highest point was about 14000 (which was WAY overvalued fueled by bubbles) and the lowest point is the trough, around 6800 (still overvalued). Now we are approaching back to 9000+ levels, seen during 90’s. I am sorry, but we HAVE NOT recovered. 26 MILLION jobs are still lost. In case you forgot, America has about 300 million people. Look at the above chart from 1990’s until now. We have not reached the bottom of the market yet. Expect the Dow to drop to BELOW 4000 sometime. Our media and financial gurus are pushing the market back up to rediciculous highs because we want it that high. It does not mean that our economy is actually improving. Nobody ever said that the Dow was a definite indicator of the economy, but seriously, look at the chart. We are nowhere near a recovery. The only companies making profits recieved huge bailouts. Banks are losing money as we speak (despite their new overdraft fee increases). 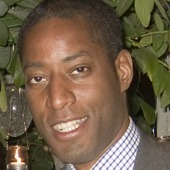 We are in for some trouble when the commercial real estate bubble goes pop! I believe that the mainstream media will do its job at keeping it on the hush. U.S. Dollar Only Down 2 Percent for the Year. Since the Crisis Started in August of 2007, the U.S. Dollar is Unchanged. Yet the Dollar is Down 33 Percent Since the Start of the Decade. The Currency Race to the Bottom. 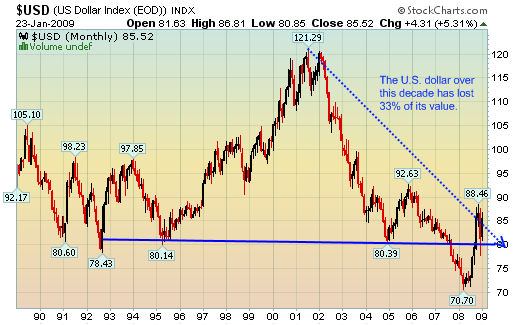 In fact, at the market bottom in March of 2009, the dollar flirted with the 90 mark. This would have been a 10 percent jump from the same point back in August of 2007. How can the dollar remain strong with so much money being funneled into the economy and the U.S. lagging in a deep recession? First, it is important to understand that at the bottom in March over $50 trillion in global wealth was destroyed. That is simply a mind-numbing amount. In the massive panic of the market lows, many people still had faith in the dollar and rushed into it. It is still largely viewed as a safe haven. Also, the major decoupling philosophy has been largely put to rest since this recession is global. 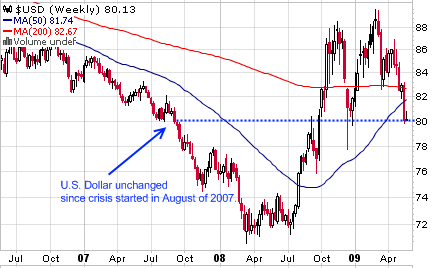 If you look at the chart above, in the spring and summer of 2008 the dollar was in the low 70s. This occurred because a large number of investors believed that the world would largely remain healthy while the U.S. fell into a deep recession by itself. That of course was not the case. Looking at this chart, we realize how much the dollar has really declined. Since the start of the decade, the dollar has fallen a stunning 33 percent. Keep in mind with currencies these kind of large fluctuations are not a sign of health. Major market volatility is never the sign of a healthy market. As I have stated before the U.S. Treasury and Federal Reserve are actively trying to crush the value of the dollar. There weapon of choice is inflation. Why would the central bankers aim for inflation? For one, our country is a debtor nation to the ultimate degree. There is simply no way we are ever going to pay back our obligations. Inflation is an excellent way to make current debts less costly in the long run (at least in the view of the Federal Reserve). Yet inflation is rarely an easy target to set especially when we are dealing with the prospect of deflation. 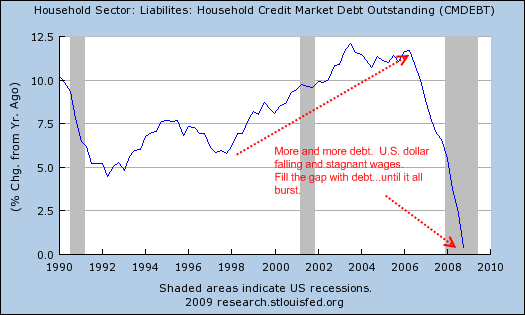 Deflation is kryptonite for debtors because the debt does not decrease over time. Think of a home that has lost 50 percent of its value. The home is now worth $200,000 while the mortgage stays at $400,000. In a simple theoretical world, a weak dollar would make our products more desirable around the world thus boosting domestic production. The only problem is we have outsourced a large part of our manufacturing base. There is no amount of lowering that is going to compete with wages put out by China and India for example. The dollar problem is compounded by the fact that globally, central banks have been cutting rates simultaneously. It has been a race to the bottom. Each economy facing their own internal pressures had to lower their fund rates to stay competitive. That is why our zero bound Fed rate has largely left the market moving in the same place. Other global bankers have also cut back like the ECB for example. Yet the U.S. Treasury and Fed are trying to exercise this dollar destruction as quietly as possible. What do you think the public would say if they realized that the central bank of our country is deliberately trying to dilute their respective currency? People would be in an uproar. (FactsNews: but yet we sit and wallow in our misery, while the Bilderberg controlled media tells us everything is ok) Yet the fact of the matter is we now have some 25,000,000 unemployed or underemployed Americans that have taken a major hit to their purchasing power. Why do Americans feel poorer? Because since the start of the decade our U.S. dollar has lost 33 percent of its value. Couple this with stagnant wages and you can understand why this recession has been so destructive. What we are now coming to terms with is the reality of our situation. (FactsNews: not so sure about that…) A currency that is worth 33 percent less from the start of the decade and the revelation that a large part of the wealth created in the 2000s was largely based on pure debt. Hard to envision a second half recovery. Looks like we are heading more to a second half realization. What impresses me in the current financial crisis is the near-total failure of so-called progressives to appreciate the magnitude of what is going on or the level of intelligence behind it. How many will say, for instance, that the crash was deliberately engineered by the creation, then destruction, of the investment bubbles of the last decade? When the financial system creates bubbles it drives up the cost of assets far beyond their true value in producing or storing wealth. When the bubbles burst the value of the assets plummets. Those with ready cash then buy them up on the cheap. When the dust settles more wealth has been concentrated in fewer hands. The rich get richer, and ordinary people are left in a deeper condition of indebtedness, poverty, and pressure to perform to the liking of the financial masters. Progressives think the system needs to be “reformed.” Maybe the banking system needs to be re-regulated or even nationalized. Maybe it should be possible for families facing loss of their homes to get a lower monthly payment from a bankruptcy court. Maybe the government instead of the private sector should administer student loans. What we fail to acknowledge is that the system itself is totalitarian. This means that it is designed to exert total control over the lives of individuals. We are accustomed to use this label when thinking of anachronisms of history like communism or fascism. We do not understand that globalist finance capitalism and the government which protects, enables, or even regulates it are also totalitarian. What has happened in the last year as the financial system has seemingly gone belly-up, and is coming back only through massive government bailouts, is part of a pattern that has been around for decades if not centuries. How the controllers work was laid out in 1967 when Dial Press published a leaked copy of The Report from Iron Mountain. This was a study put together by a team of academics and analysts who met at the underground facility in New York that was home to the Hudson Institute. The appearance of the report caused a sensation when it came out at the onset of the Vietnam War. Officials within the government had no comment, and the report faded into history. But certain of its sections fit the situation in 2009 precisely. We see the development of such a “sophisticated form of slavery” today. What else can a system be called that subjects the population to skyrocketing personal and household debt, a widening gap between the rich and everyone else, constant warfare justified as necessary to fight “terrorism,” erosion of personal freedoms, constantly expanding power allocated to the military and police, pervasive electronic eavesdropping, complete lack of accountability by politicians for their dishonesty and crimes, a mass media devoted solely to establishment propaganda, etc. None of this seems to be diminishing under the Barack Obama administration. Even the economic recovery Obama is attempting to engineer through massive Keynesian deficit spending is expected by economists to be another “jobless” one like that of 2002-2005. Of course the unemployed or those who fear unemployment are easy to control. And the permanent series of Asian land wars George W. Bush instigated for control of resources and geopolitical leverage against Russia and China continue unabated. None of this is accidental. As The Report from Iron Mountain made clear four decades ago, it’s what has been planned all along.